The newest sensation sweeping the American auto market is the growth of various types of electric cars. Ranging from full-electric cars such as the Tesla automobile to hybrids where an electric power train is combined with an internal combustion (IC) engine, these cars are becoming ever more popular in America, presenting new opportunities for auto mechanics all over the nation. However, auto mechanics must also prepare to face a market with radically changing requirements and opportunities. Currently, the two primary types of electric vehicles currently available in America are hybrid electric cars and all-electric vehicles. In both cases, the car is propelled by an electric motor rather than being directly driven by an internal combustion engine. Hybrids combine an IC engine with an electrically driven drive train. In some cases, the battery system is used to “even out” the power needs of the car rather than permitting the car to be driven on batteries along. This allows the IC engine to always operate at its more efficient RPM, rather than the way it functions in an all-gas car, where the engine is often forced to operate at highly inefficient speeds, vastly decreasing fuel efficiency while also increasing the amount of pollution that is produced. For this reason, hybrids are highly fuel efficient in local street driving, where pure IC vehicles suffer the most from the numerous stops. The design benefits from the quiet drive of an all-electric car while also having the same range as an IC powered vehicle. In some cases, the car’s battery can also be recharged from household current or a charging station to further minimize fuel usage. These are highly useful cars for those individuals who combine local driving with the occasional long-distance trip. All-electric vehicles do not have an IC engine and are thus completely dependent upon an external power source to charge their batteries. Although traditionally seen as short-ranged vehicles, all-electric vehicles are becoming increasingly competitive with IC vehicles as more sophisticated designs allow for greater range and faster recharge times. The primary advantage of an all-electric car is the fact that it is emission free for the owner, not having the unpleasant odor and health issues that can be associated with an IC engine. In addition, the ease of recharging the car at night or at a charging station can make it easier for elderly individuals to make use of the vehicle. The primary disadvantage of this vehicle is the fact that individuals who have an irregular driving schedule or who are located in a region that doesn’t have very many charging stations may find it difficult to keep the vehicle fully charged during their daily activities. In fact, this remains the primary obstacle to the widespread adoption of all-electric vehicles, although the number of dedicated charging stations in America is rapidly growing. Because electric motors tend to require less maintenance than IC engines, mechanics must be prepared to adapt their business model to the specific requirements of today’s electric vehicles. Because electric motors do not use oil or spark plugs, they will require far less in the way of regular maintenance. However, hybrid vehicles will still require regular oil changes and spark plug replacement and as this type of vehicle is likely to remain very common, auto mechanics will still benefit from regularly servicing their customers’ IC engines, whether they are mounted in a pure IC or hybrid model car. The adoption of regenerative breaking technology, where a generator converts the car’s momentum back into electrical power to charge the battery, is likely to drastically reduce the need for replacement brake pads. Ultimately, this could result in future cars needing little if any repair for their brake systems. However, this is more likely to be an issue for the various single-service brake and oil changing businesses rather than a dedicated mechanic’s garage. Another area of reduced repair will be emission control systems. Obviously, pure electric vehicles will not have any emission control systems to be repaired, while hybrids will tend to be more efficient, producing less in the way of emissions and thus likely requiring less work on their emission control systems. Especially in states where there are strict emission control regulations in place, this could result in a substantial reduction in business for those mechanics specializing in this field. However, there are a vast number of areas where the mechanic will continue to enjoy a great deal of business. Cars, whether hybrids, all-electric or IC vehicles will continue to need repairs on their internal switches, fittings, bearings, vehicle suspensions and other systems. Especially as the vehicle ages, these systems will require even more repair, especially if the lower cost per mile in terms of fuel expenses results in the vehicle being driven more often than its IC counterpart. Another area where mechanics will continue to enjoy excellent business is in the field of collision repair. Not only are electric cars vulnerable to damage from colliding with other vehicles or fixed objects, they are generally lighter in design than other vehicles, meaning that any given collision will likely result in worse damage to the frame. Those mechanics specializing in this field are unlikely to see any change in their business due to the growth in the number of electric vehicles. One factor that cannot be predicted with any accuracy is how much long-term maintenance these vehicles will require. Although many experts feel they will require less than traditional IC cars, the fact is that modern electric cars are a new phenomena and many are not even a decade old. Mechanics should be aware that unexpected technical issues may result in these vehicles needing more maintenance than is currently estimated. This will be especially true as a growing number of owners find that their dealer warranties have expired and must then find other ways to maintain their vehicle. 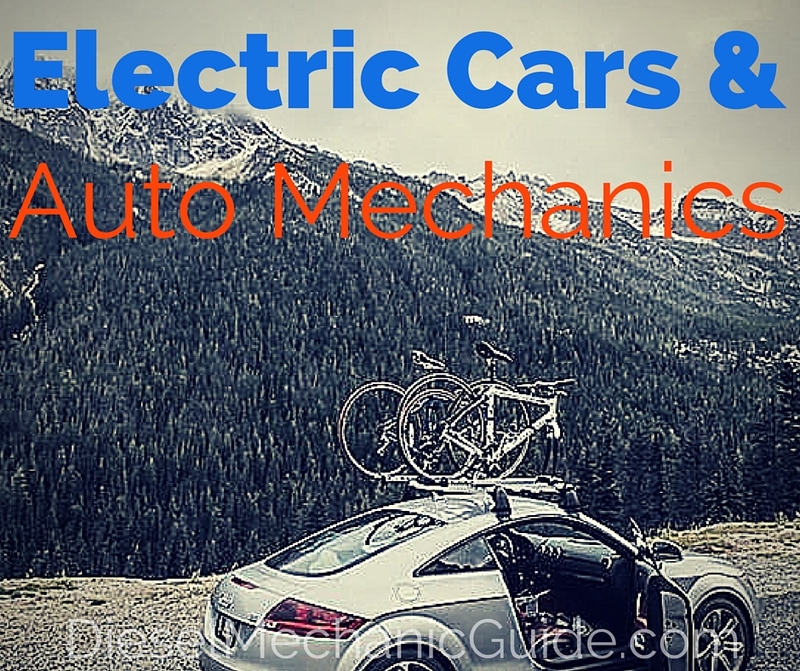 Ultimately, today’s auto mechanics should not panic about the increased usage of electric cars. There will always be a need for a skill mechanic to address mechanical issues in a vehicle. 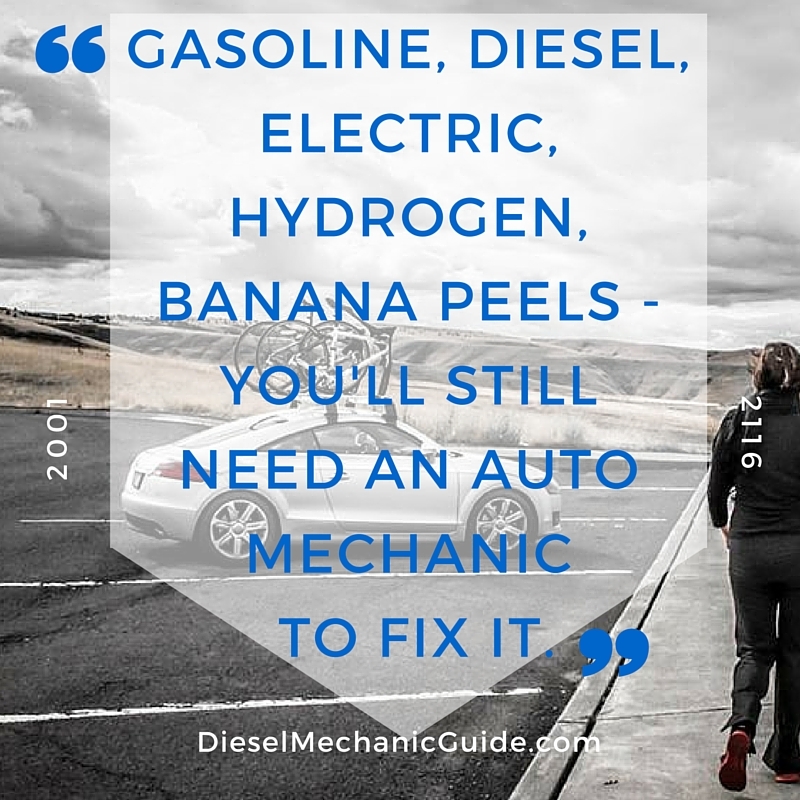 However, today’s mechanics should also be certain to focus on remaining up to date with the current state of the art in electric vehicles, while also remaining aware of potential future developments that might change the nature of the automotive repair field in America. As with other aspects of the automotive field, a mechanic who ensures that he or she is aware of current and future technological developments in electric cars will be one who is prepared to adapt to the changing nature of this field. Electric cars pose a challenge to the auto mechanic, just as the adoption of automatic transmissions, diesel engines, and emission control systems did. However, it also presents opportunities as an entirely new technology is fielded on American’s highways, a technology that will require skilled mechanics to maintain so that the American people can continue to enjoy their vehicles. When you come to Western Technical College, you will find yourself surrounded by like-minded individuals. Your classmates and friends are just as passionate about building a successful career as you are. Your instructors are totally dedicated to your success. Everybody will work with you to allow you to successfully pursue a career in your chosen field. Each program is designed to train inexperienced students for entry-level employment or to upgrade skills for experienced professionals. At Western Technical College, “Welcome” is much more than simply a greeting. It is a belief that is embodied by each and every staff member — from the first time you contact us, through graduation and throughout your career. We attract students from Ciudad Juarez, just across the border in Chihuahua, Mexico as well as Las Cruces, New Mexico, just an hour north. Being so close to Fort Bliss, we also provide career training for our military veterans. Provide quality training and education in a caring, professional environment that prepares new students and working adults with the skills they need to succeed and advance in their chosen careers.